As a costumer I rarely use patterns when I sew – generally I just draft from scratch – and yet I’ve managed to accumulate over a thousand vintage patterns. I can’t resist them! Often when I go to see people’s wardrobes, there will also be patterns (and fabric, that’s another story) and they’re one of those things that can all so easily be thrown out. Listing some of my patterns on the webshop today I noticed this style that incorporates a lot of what I look for in a frock: plunging V neckline, nice big full bishop sleeves, empire line, assorted lengths. I also wanted to pin down the date: was it late ’60s or early ’70s? 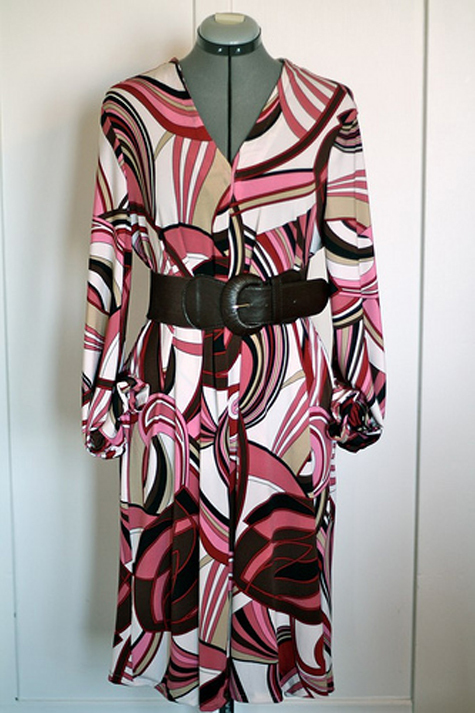 Despite fashions changing rapidly during this decade, popular styles clung on, sometimes for a long time. As I’ve mentioned previously, vintage patterns can be much easier to date than finished garments because you have clues in the style of artwork, hair and make up plus accessories. 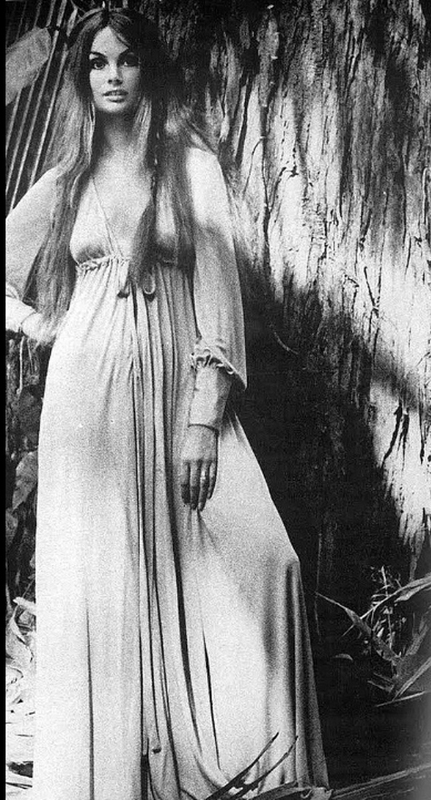 The full hairstyle on the blonde suggests pretty close to 1970, as do her chunky heeled shoes (visible just under the hem of her long black maxi). Google is your friend – I quickly found the Vintage Pattern Wiki entry – a great resource if you haven’t discovered it yet – which supplied the date. 1969, and reissued in 1970 – and a number of places you can buy it online. The prices were surprisingly high, suggesting a popular style or a premium for the “Vogue” brand. Then I found a review at Sew Weekly by Mena Trott who had made the dress up – here’s a photo she posted. She called it the “Where’s my coke, Lester?” dress. You can see she’s made the neckline more demure, reducing the decolletage. Mena made it up in a heavy polyester, which didn’t hang as well as she would have liked. Perhaps she’ll try again in a lighter fabric? As anyone who sews can attest, the success generally depends on what fabric you choose – I’ve made that mistake many times, especially with trousers so perhaps that’s why I don’t wear them? It’s a good idea to follow the fabric suggestions on the pattern packet. Gosh, how did we ever cope without the internet and all the information available? Marvellous! Photo copyright Urban Rustic. If that wasn’t enough, I found a pic of my favourite ’60s model, Jean Shrimpton wearing it in a David Bailey photo. I think that’s twice in one week Miss Shrimpton has appeared in my blog. Photo copyright David Bailey, 1970. Mr Bailey was engaged to Jean in 1964, and together they produced some wonderful fashion shots. If you’d like to try your hand at your own Vogue dress, the pattern is now available in the webshop: unless I decide to try it myself, of course! Very nice post… Absolutely adore the photographs of vintage dresses online. Especially the one Miss Shrimpton is wearing. Thank you! It’s the black one. As I recall,it was available through Vogue Patterns. Am I imagining things? I cannot seem to find any reference to his collaboration with Vogue patterns at all, yet I know he did. Could you help clear this up, please? Thank you so much. Hi Stephanie, Vogue patterns did collaborate with some designers but I can’t find anything on the Vintage Pattern Wikia. You can see their Vogue page here. The major designers were very influential though and it’s likely that there would have been similar patterns that didn’t feature the Ossie Clark name – for example, I’ve seen dresses that look like the black one and haven’t featured Ossie’s name. It shows a lot of ’30s and ’40s influence, like many of his designs.